Bitcoin price cleared the resistance at $7,300 and stepped above $7,380 to record the highest levels this month. Joost van der Burgt analysis uses the correlation between Google trends and Bitcoin price performance since May 2017. Bitcoin has remained bullish since the dip to the support at $6,800 mid last week. The price revamped the uptrend jumping above $7,000 and extending the gains above $7,300. 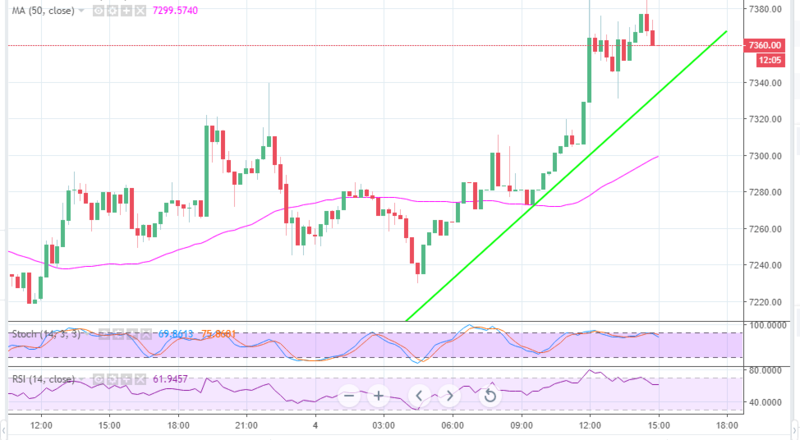 A slight retracement occurred yesterday but Bitcoin remained supported at $7,200. Bitcoin spiked gain today, Tuesday 4 and overcame the resistance at $7,300. It brushed shoulders with $7,400 recording the month’s highest level at $7,387.92. However, the performance of Bitcoin price stopped the correlation with Google trends at the beginning of 2018. For example, BTC surged to $10,000 in February while the trends on Google were decreasing. Therefore, it is very unlikely that Google trends will reflect the performance of the crypt in the upcoming months. Meanwhile, Bitcoin is trading above the trendline and the 50SMA (15-minutes). There is a lower correction trend progress from the month’s high. A short-term support has been established at $7,340. In addition to that, $7,300, and $7,200 will halt declines towards $7,000. However, $6,800 is still the nearest primary support.